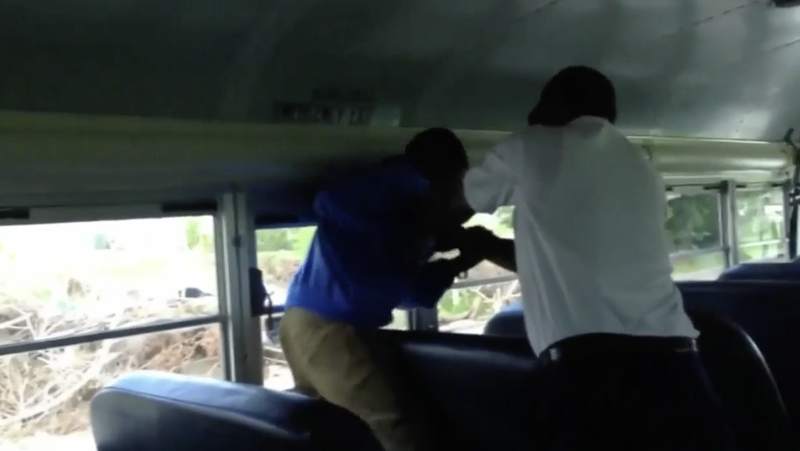 Cellphone video taken by other students shows a school bus driver pinning a young student against the windows of a bus as his schoolmates watch on in horror and scream for the driver to stop. According to WPLG-TV, the incident occurred last week on an Aventura Waterways Preparatory School bus when the bus driver and the 13-year-old boy got into some kind of scuffle. Other students managed to break them up, but the altercation did not end there. The upset student can be seen walking down the aisle drumming his fists together. The driver follows him and grabs the boy by his hoodie, pressing him against the windows inside the bus as students start screaming for the driver to stop. One girl can be seen on camera going up and physically trying to separate them. “He said, ‘Mommy, I can’t breathe. This man was trying to kill me,’” Diana Cowan told the news station about her son, Raedrian. Now Cowan is concerned for the safety of her son and other students; she says the school did not appear to be taking the incident seriously. The vice principal even allowed the boy to be taken home that day by the same driver, despite the earlier altercation. “If [the vice prinicipal] is hearing that my son was physically abused by an adult, she should have done something to keep my son safe,” the concerned mother added. Cowan said her son is now being picked up from school. Meanwhile, a school district spokesperson said that the incident is currently under investigation.